In my quest to help explain the UK to non-Brits and the US to non-Americans, I am presenting this list of what each US state is worst at, from the website Thrillist. In understanding America, you need to realize that the US is an uneasy and disjointed collection of 50 states, all different in terms of their laws, culture, and heritage. This is a very quirky list, but there is truth to be found. 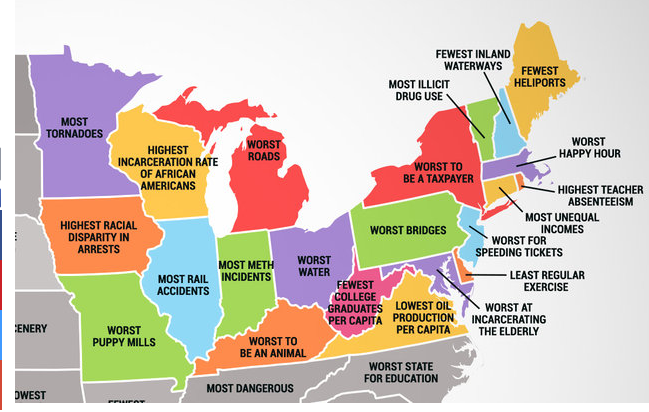 For instance, New York State, the big red blob in the upper right, is the “Worst to be a taxpayer.” For once, I was glad to see that my own state, Massachusetts (the purple blob to New York’s right), was spared this description. For decades, Massachusetts’ nickname has been “Taxachusetts,” which, as well as being known as the most liberal state, has helped doom the chances of every Massachusetts politician trying to win national office. West Virginia, the hot pink blob in the lower middle, has the “Fewest College Graduates per Capita.” This makes sense; it’s an extremely poor state, with lots of money made from coal, but since the money goes to the mine-owners rather than the miners, few people from the “hollers” of Appalachia have been able to pull themselves out of poverty and into college. I don’t know if this has to do with carelessness that inflicts train conductors as soon as they hit the Illinois state line, but what is true is that Chicago has historically been a hub of rail traffic. In 1865, a man called George Pullman became well-known for luxury sleeping cars, called “Pullman cars” in his honor, after he loaned one of his cars to carry the coffin of President Abraham Lincoln after Lincoln’s assassination. It only stands to reason that the state that is the “freight handler to the nation” has the most rail accidents! Follow this link to learn what the rest of the US states are worst at, to perhaps gain more of an understanding of this complicated, interesting country.